The closure of the custody suite at Solihull Police Station presented a new challenge for Coventry and Warwickshire Partnership NHS Trust's Criminal Justice Liaison and Diversion team. Some people arrested in Solihull are now detained at Little Park Street Police Station in Coventry city centre, but any mental health trust records they may have are probably held at the neighbouring Birmingham and Solihull Mental Health NHS Foundation Trust. Paul Morgan is a mental health nurse who works as part of the Coventry and Warwickshire Criminal Justice Liaison and Diversion team. The team works out of courts and police stations in the area, assessing the mental health needs of people who have come into contact with the criminal justice system, from early morning until late evening, seven days a week. The recent closure of the custody suite at Solihull Police Station means that people arrested in that area are now detained at other police stations across Birmingham and Coventry. As a result, Paul and his colleagues have noticed an increase in the number of people they see whose home address is in the area covered by the neighbouring Birmingham and Solihull Mental Health NHS Foundation Trust. 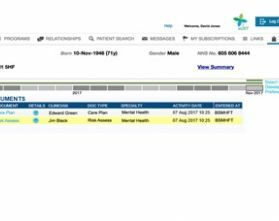 The MERIT Electronic Health Record Viewer has made it easier for Paul and his colleagues to know when someone who is referred to them is open to services in their home area. Paul recently met Joe [not his real name], a 36 year-old man from Solihull with an extensive clinical history (mainly for low mood and suicidal ideation), after Joe was arrested for a drink-driving offence one Sunday afternoon. “The MERIT Electronic Health Record Viewer formed the basis of my triage process for Joe. I could see that he was open to outpatient services, and I made contact with his responsible medical officer at the partner trust, giving me a clearer understanding of his background and his current level of need. “I was quickly able to build a clinical and risk picture which only developed further as I spoke with Joe. Because I had already made contact with his existing clinical team, I was able to share a copy of my assessment so that we could both ensure that my intervention was consistent with Joe’s existing care plan. “I could see that Joe’s mental state had deteriorated somewhat since his last appointment: he was due to have a follow-up appointment in a few weeks’ time but this was brought forward after I discussed my assessment with the partner trust which more usually provided his care. This earlier appointment was probably more suitable for Joe, because of the level of clinical need he displayed and the risk he posed to himself and to others. “A short while later I received a follow-up email as a courtesy from his home trust, to confirm that Joe’s medication had been adjusted and he now appeared to be more stable.